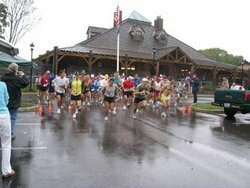 This is the rainy start to the Gillette Castle Half-Marathon, on October 15th, 2005. This race was my longest so far, and a little disappointing, as the hills and rain took there toll. I finished in 2 hours and 4 minutes. For 2005, my best race was the Tarzan Brown Mystic River Run. I finished in 39 minutes and 14 seconds, good for 21st out of 116 runners in my age group. This year, I'll be aiming for consistent sub-sevens in 3 mile runs and a sub-seven pace at the Tarzan Brown run. This will be my 2006 running log. I'll soon post a short summary of 2005 and some pics.